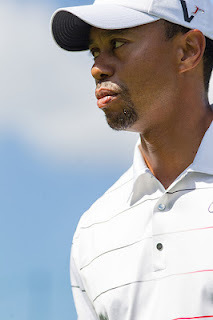 My definition of “backness” is “the state of, or condition of, being back.” This is on the minds of many of us in the golf world as it concerns Tiger Woods. We are more than four years removed from his last major victory at the 2008 U.S. Open. Yet Tiger is winning again. He has three PGA Tour wins this season, more than anyone. This topic came up for me this past week in a radio interview. Is Tiger back? It depends. If being back means hitting technically proficient shots with increasingly ordinary effort, if it means a relatively calm putting stroke, if it means sound course management and a placid existence because his marital and adultery scandal no longer comes up on or off the course, then Tiger is back. He has demonstrated that he is again performing at a level matched by few. With three PGA Tour victories this year, he would be player of the year if the vote were held today. Some would say that is the definition of being back on top. But if being back means seizing the major champion’s moment and facing the attendant pressure with so few hiccups it intimidates others into flinching, if it means making the stellar effort seem routine, if it means drawing the momentum to your side and letting it propel you where you need to go to win not just a PGA Tour event but a major championship, then Tiger is not back. Put another way, on a backness scale of 1 to 10, you could say Tiger is a 5, halfway back. He needs a major. He knows it. We all know it. The PGA Championship is his last chance until next April. Honestly, we all know how much of golf is "in the head", the six inches etc (fnarr). Tiger's six inches have been all here, there and everywhere since '08. I don't think we can say he's back until he lifts another major, and I honestly don't think the PGA is his tournament, with his basically 16-handicap driver right now. Great blog, and great post! I think another creative word here can be used, and that is "tigerness." This can be defined, as referenced by Pennington's title, as "the state of being aggressive and using killer instincts." He seems to be lacking confidence, like he's second guessing everything from his "plan" to his swing. And maybe he's lost some because of his injury and the media storm of his personal life, but I think he has to trust in his own instinct and ability. I think he has to trust in his tigerness to fully envelope backness. Just a thought. The whole Tiger's Back, Tiger's not back debate has become exhausting. He's won on tour 3 times this year, so in my mind that's "back", but some critics won't be happy until he wins another major, WHICH WILL HAPPEN!. Just let the guy play golf and enjoy watching him. Is that really so hard? In my mind, Tiger won't be completely back until he can figure out a way to win a major. The trouble is, to win a major, at some point, you have to drive the ball well, with the driver! Tiger's wins so far this year have occurred when he did not need to hit driver more than a couple times each round. At the PGA, the Ocean Course will play at 7,600 yards with a lot of wind. Not sure he can rely on 2-iron stingers there. Tiger won't be completely back until he finds a way to win a major, and he won't be able to win a major until he figures out the driver.